Duncan Harris is adept at making games pretty at Dead End Thrills. 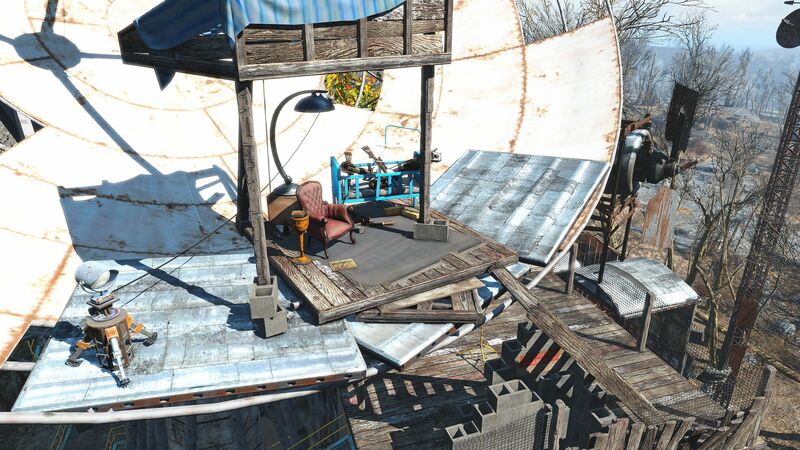 He’s spent the past week crafting a more artful wasteland using Fallout 4‘s settlement tools, console commands and mods, and has written this guide to building the best settlement possible. You can thank my five-year-old’s fear of practical special effects for this. Ever since I told him that Labyrinth was “sort of real, in a sense,” he’s fled the room whenever anything like it is on TV. I thought it’d spark his interest in being an artist when he grew up, but he just ended up hating The Muppets. As for George Of The Jungle… meltdown. I’ll usually be on the computer in that event, and he’ll come in asking if “you can build things” in whatever I’m playing. That’s after I’ve deflected other awkward questions like: “What’s he going to do to him?” (Hitman), “Is he running them over?” (Arkham Knight), and, in the case of Fallout 4, “People died in this game, didn’t they?” And if that Nick Valentine quest breaks again, trust me, they will. 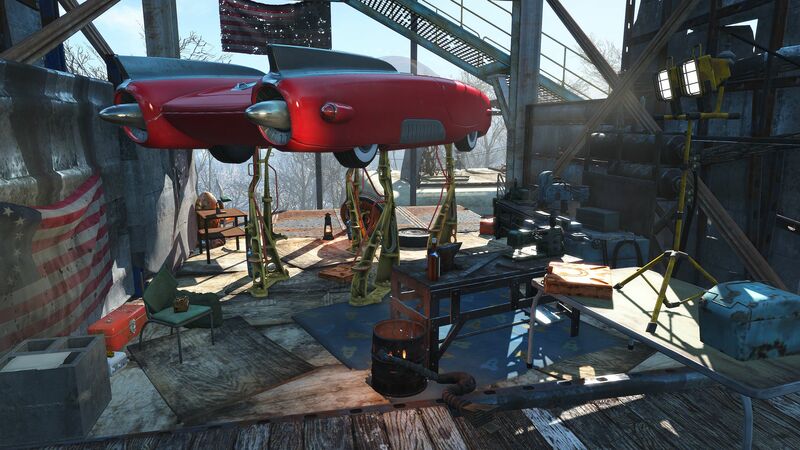 I hadn’t planned on building anything in Fallout 4. Big corrugated castles for carrots is what I’d gleaned from the tutorial, and there’s enough Minecraft in my house already. But what can I say? It got me. Something about the physically-based shading, the tumbledown game world, and the accommodating lore makes it incredibly easy to build things that feel right. Add mods to that equation and, well, you’re in trouble. Building something in Minecraft requires an awful lot of forethought and experience. Maybe it’s just me, but it feels like there’s little point starting something in it if you don’t know how it’ll end. This isn’t the case in Fallout 4. All it takes is a good kernel of an idea for any subsequent fumbling to play right into the game’s art style. Furthermore, if you want post-apocalyptic reference material, you only have to walk down the road. Quick, before a beta patch stops them all working! Oh. Best you don’t download that. Settlement Supplies Expanded and Homemaker: More things, basically. Lots more. Be advised that both of these mods were made using the controversial FalloutSnip, the predecessor of which was linked to broken saves for Skyrim. Fallout 4 seems quite capable of breaking them by itself, but steer clear of these if you don’t want additional anxiety. I haven’t had any problems yet. Place In Red: This is a Cheat Engine table, so familiarise yourself with that by reading the description. But don’t be scared, though, because it’s invaluable. You can’t place stuff anywhere with it, but it gives you a lot more freedom. This console command: ‘player.placeatme c1aeb’. 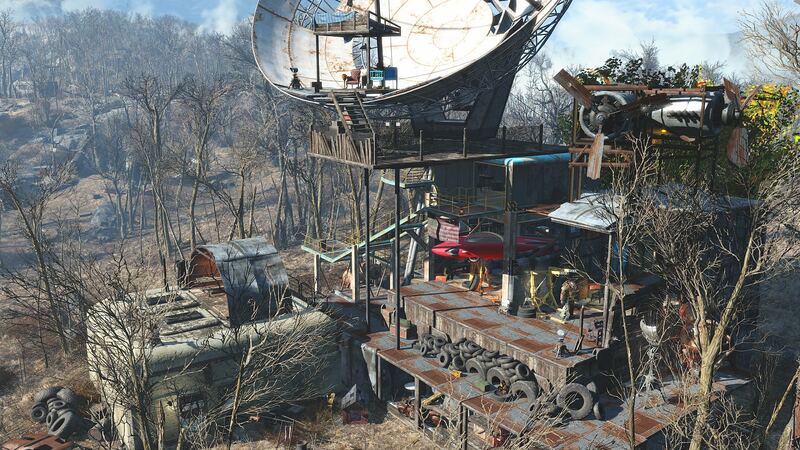 This spawns a workbench, which makes it possible to build a settlement anywhere in the Commonwealth. How cool is that? 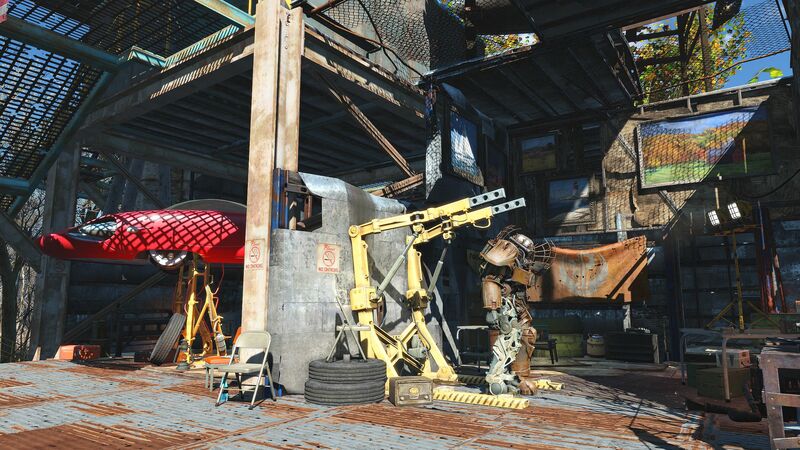 I’m not sure if you could, say, make a giant Mirelurk using ‘setscale’, spawn the workbench on its head, then make a roving ‘crabernacle’. Someone please find out. This is ‘Dead End Hills’. Hu-huh. I reckon it’s about a quarter finished – but it’s not going to get any bigger. That’s important. I find it much more fun to build something small and detailed than just a sprawling mess of boxes. This comes back to the point about having a neat idea at the start. I have a thing for big radar stations. There’s one near where I live, and many a time have I nearly wiped out my family by staring at it rather than the road. This has come with me into Fallout 4, where I’ve abandoned the residents of Sanctuary for this dishy little number round the corner. It has a wicked basement, too – just don’t mind the raiders, they’re ‘sleeping’. Initially, USAF Satellite Station Olivia has a mercifully small shack stuck to it. Without the GECK, I haven’t found a way to remove a lot of the stuff embedded in the game’s world cells, so the idea was to entomb the old structure in a new one. Somehow putting an armchair in the dish was a no-brainer, but that was it. The high-ceilinged workshops, which turned out to be the most fun to decorate, happened almost by accident. Ditto the wind turbines, and even the way the structure harmonises with the existing architecture, making it a bit more interesting that the usual pile of wood and metal. There are other console commands you should learn. Cheat. Go on. Admittedly, it took the game breaking one of the main quests for me to finally snap, but I’m glad I did it. I don’t use it for regular play, but I also don’t see the benefit of ‘gamifying’ an editor environment with endless resource-related limits. If you want this stuff to look good, don’t let the game effectively paywall your options. Not only does god mode gives you unlimited resources for building, it also avoids any feng shui-related deaths when decorating your balcony. The ‘tcl’ console command toggles the game’s clipping, which in the building editor lets you fly around. This makes it a lot less painful to find those initial placements. A side-effect is that you might not be able to correct the position of something without toggling it off and on again, as it seems the clipping is needed to register the new object with the editing tools. Can’t overstate how important these are. I’ve used them literally thousands of times. The ‘Place In Red’ table frees your hand a lot, but not enough. If you want to really set off the PBR materials and ambient occlusion to make everything click, you want to ground things more than the game’s inclined to. Placed using the vanilla tools, or even modded ones, things sit awkwardly and leave massive, obvious holes. Opening the console, clicking an object, then using ‘getpos’ – you’ll need to supply a x/y/z axis as well – gives you its coordinates. You can then use ‘setpos’ the move it pretty much anywhere: into the ground, on a table, in the air, and even into other objects. What’s more, the game honours these positions across saves and relaunches. If you’re brave, you can also use ‘setangle’ to control rotation. 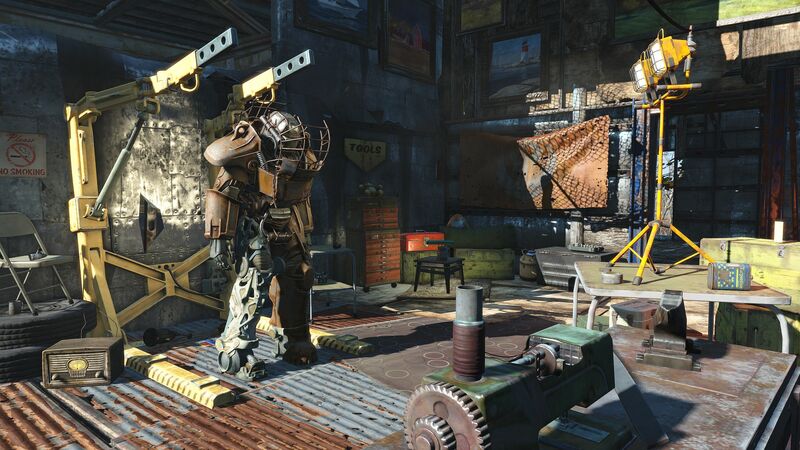 Fallout 4’s dilapidated art style (and asset quality) is great for this, because you can just mash things like walls together and arguably improve their look, adding variety to otherwise simple surfaces. I have found, though, that objects start jittering when you use setpos, which you’ll notice immediately. The solution is to just repeat the command to fix them in place. Setpos means you can align walls, floors and ceilings with pixel precision – and quickly, because a lot of those values will be the same. Bear in mind, though, that trying to use the exact same values for floors will result in z-fighting between the textures – an unmistakable flicker – which can be solved by just nudging one of the objects off by a pixel or two. There are two facets to this. 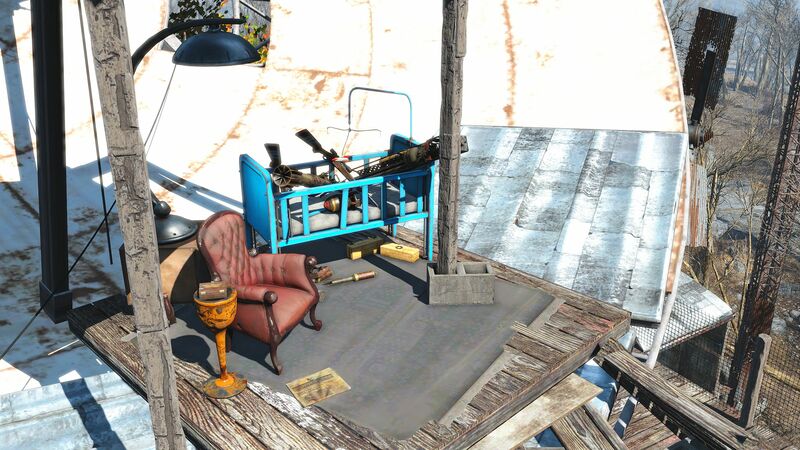 One is about placing lots of junk around, which again is why it’s good to keep the place small. The other is about making that junk believable. This is the most addictive part of the process, because it very quickly starts crossing the line between incongruous modding and Bethesda’s own world-building. Embrace the role-play: where would your character want items and furniture, what would they do, and what would they leave around? This gives new value to the ‘Junk’ category in your inventory, because suddenly you do need a screwdriver and that poisonous box of peanuts. What comes in extra handy here is grab-and-move. You know the button for picking things up – but if you hold that button down, you can move things instead. Again, against all odds, the game doesn’t mess it all up when reloading. You will, though, if you clatter about the place too much. Some problems just can’t be solved directly. The more you start kitbashing the game’s assets into strange new forms, the more of those you’ll find. Maybe you’ll notice textures starting to tile when used in sequence, or a spot where the asset quality is just conspicuously bad. Chances are you put those objects there for a reason, though, so try and ‘fix forward’ by covering the problems, not removing them. 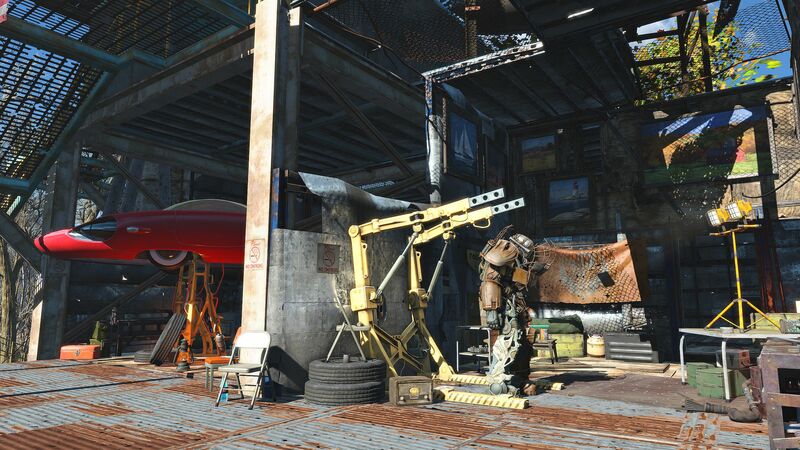 The settlement mods give you a few stickers and signs to play with, and future versions will hopefully introduce many more decals. I’m waiting for posters, personally. You’ll also find that the simple marriage of two random objects just isn’t realistic. The seams will show as badly, if not worse, than any glitch. I’m not sure the building inventory has grown enough for this yet, but developer Luis Antonio covered it neatly when talking about his work on The Witness, and how quickly you can dress these ‘connections’. You’ve played enough open world games to know that even the most sophisticated time-of-day cycle can’t light a game on its own. Christ, there are points in some recent games where you’d think there was no lighting at all – and in some situations you’d be right. Even with mods, the lights available in Fallout’s building editor aren’t great. Most are too bright, but some are quite good for breaking up monotonous spaces and picking out certain ‘flavour assets’. Just remember that light needs the dark, so try and avoid washing everything out. Ultimately, the best light in the game is still the one that rises in the morning and sets in the evening. Putting lights down everywhere is going to look rubbish very quickly, so think about maybe knocking a wall panel out, or replacing it with one with some holes or mesh in it. Giving the sun or moonlight a route through your base can have spectacular results, but it has to be done with care. I think that’s it. I haven’t covered those famous light panels because I haven’t got round to turning the dish into a tribute to the Death Star yet. I also don’t want a base that’s just a platform for a humongous neon sign. Spawning the workbench where it shouldn’t be doesn’t quite build a complete settlement. A lot’s being written about what does and doesn’t work, and you’ll find that settlers don’t behave as they should, assuming you can even get them there. No doubt this’ll all be fixed when the official modding tools arrived. I’m glad I started doing this all now. Having fewer items has probably helped with building a skeleton for my base, and is always good for creativity. It’s also given me something to subscribe to as the modding takes off: I’m already buzzing with the thought of numerous potential updates, none of which is the usual texture or ENB mod. And when I finally stop decorating and return to Nick Valentine standing at that guy’s door, you can bet I’ll be frisking every corpse to see what tat I can put on my mantelpiece. Speaking of which, who brings a broken desk fan to a gunfight anyway? 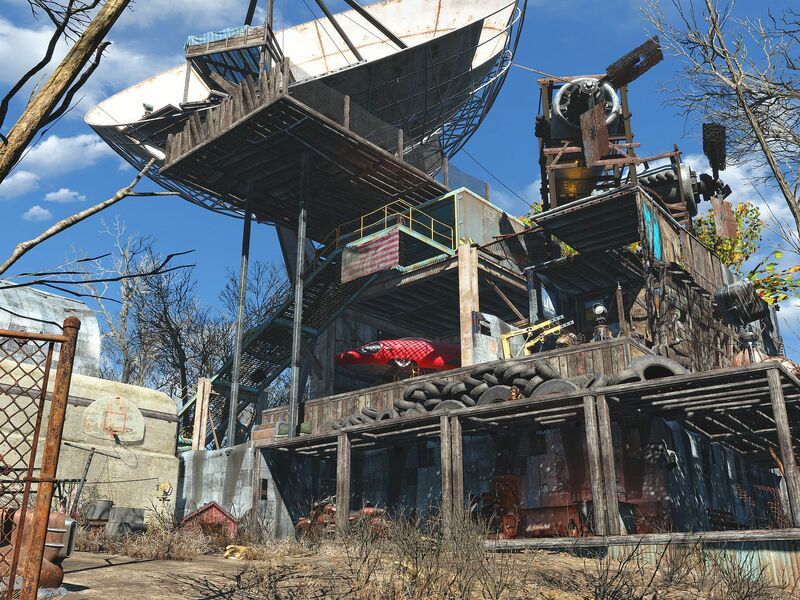 Tagged with Bethesda, Building Guide, feature, guide, Fallout 4.